Last time we explored how your body — a tube of cogitating meat that you (sort of) identify with — isn't really a thing at all. It's not a solid object, something you can pin down and point to, something with well-defined boundaries. It's more like a nebulous, swirling eddy. Less like a table, more like a tornado. This was a kind of slippery-slope argument(*): If you identify with your body, then there's nothing to prevent you from identifying with arbitrary matter outside your skin, because there's no firm, objective principle to discriminate 'your' atoms from 'other' atoms. If you identify with your body, i.e. a chunk of matter, i.e. a particular subset of the physical universe, then that identification is a choice, and largely a matter of aesthetics. (*) Slippery —> difficult to grasp —> un-tenable. But of course you don't really identify with your body, not in any fundamental, metaphysical sense. Like most Westerners, you probably consider your body more like a possession or appendage — like a vehicle that 'you' (the real 'you') lumber around in. You don't identify with your body any more than you identify with your car. You (the real you) aren't a body, but rather a mind. Cogitas, ergo es: You think, therefore you exist. And your thinking, your consciousness, is your existence. When it goes away — as in death, or even just a coma — 'you' go with it. All of this may seem perfectly self-evident. But it isn't. "Your mind," it turns out, is just as nebulous as "your body," just as porous and hard to pin down, perched on the same slippery slope. When you identify with your mind, there's nothing in principle to prevent you from identifying with arbitrary other parts of the universe. Once again, personal identity dissolves into (mere) aesthetics. Here are some of the ways it dissolves. Memories are clearly part of your identity. If you knew, for example, that you were going to wake up tomorrow with complete amnesia, you'd scramble to perform your last rites (like telling your family how much you love them) before it was too late — just as you would if you were on an airplane about to crash. So memories are an important part of who 'you' are. But here's the thing: Memories don't all live cleanly inside your head. Maybe you think the notes you've jotted down aren't important enough to be included in Who You Really Are. Fair enough. But what about your favorite books, movies, or albums, the ones you keep coming back to every so often? Why can't those be part of 'you'? Or photographs. These are an interesting edge case, because the memories don't seem to live 'in' the photographs. Instead, each photo is like a key, which triggers or accesses a memory that actually lives in your mind. But without the photo to act as a key, there may be no other way to access the memory. What then? If a memory is rendered inaccessible, it's lost. Sometimes you lose memories by synaptic degradation; other times, by misplacing a photo. Bottom line: If someone took away all your journals, books, albums, photographs, and mementos, he'd be taking away some of your most cherished memories. Sure those memories don't always live 'in' the physical artifacts per se — but so what? Wouldn't you rather lose a few 'real' (mental) memories than your entire collection of externalized (physical) memories? Here's a provocative claim: Parts of 'you' can be found not only in your own brain, but also in other brains. We think this only applies within a single brain, but that's an analytic prejudice of the West. I'm not suggesting there's a direct (synaptic) connection between the neurons in your brain and those in your friend's brain — that would be patently ridiculous. But consider that when you perform an action, the mirror neurons in your friend's brain predictably fire. Thus in a very real sense, you can control her mirror neurons. 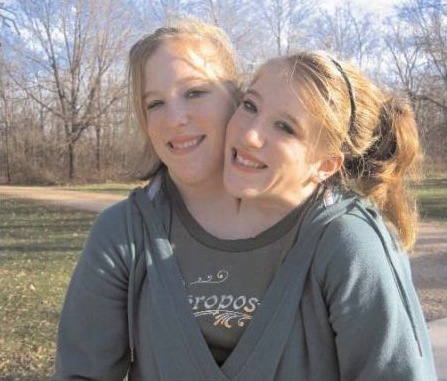 Hell, it doesn't even have to be mirror neurons. When you shout something at her (like "Cease fire! "), her brain will automatically register those words, activating the corresponding nodes and putting your idea at the front of her mind. Short of plugging her ears, she can't do anything to stop it. Thus you can 'prick' or 'strum' her brain in a predictable way, even from a distance. How her brain responds to the prick is partly up to 'her,' but not entirely. Maybe you've been charming her with rewards, or bullying her with punishments, to get her to follow your will. If you're successful in training her, it's only our body-boundary prejudice telling us that the neural network you've trained is still 'hers' rather than 'yours'. 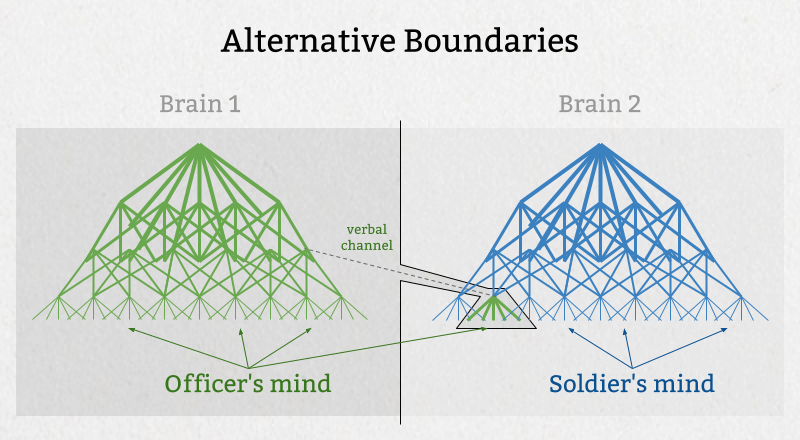 When a military leader has spent months training his troops to follow his every command, he then has very real (if indirect) causal influence over the brains in his unit. Why do we insist that his mind ends at the boundaries of 'his' neurons, and the other minds begin at the boundaries of 'their' neurons? Arguably, it's just as parsimonious to say that his mind extends into their brains. It's perhaps telling that even the legal system in the military agrees with this alternative way of carving up personhood, or at least personal responsibility. If an officer issues a command which later turns out to be wrong or criminal, it's the officer, not the soldier, who's responsible — even though it was the soldier's physical person that carried out the crime. The soldier would excuse himself by saying, "I was just acting on orders." But this is a polite way of saying, "My brain was under external control" — or even, "Part of my brain, the part trained to respond to my commanding officer, wasn't really 'me' at all." Here's an example that's closer to home. I've long carried a little agent inside my head, a 'voice' I label as my mother's. It's not a real (spoken) voice, more like a conscience-of-sorts: an intention or feeling that springs to mind whenever I'm about to do something 'wrong,' e.g., waste food or money. One way to understand the voice is that it's part of me: it's my internalization of my mom's advice. But is it really mine? It seems equally valid to understand the voice as, simply, belonging to my mother. That's how we'd describe it if she had implanted the voice as a tiny mp3 player in my ear, rigged to speak her advice under certain conditions. And so the mere fact that she implanted the advice in my brain — by way of rewards, punishments, and repetition — doesn't seem like enough of a reason to deny that the voice is still hers. As a society, we can't be expected to deal with how weird and messy this is. 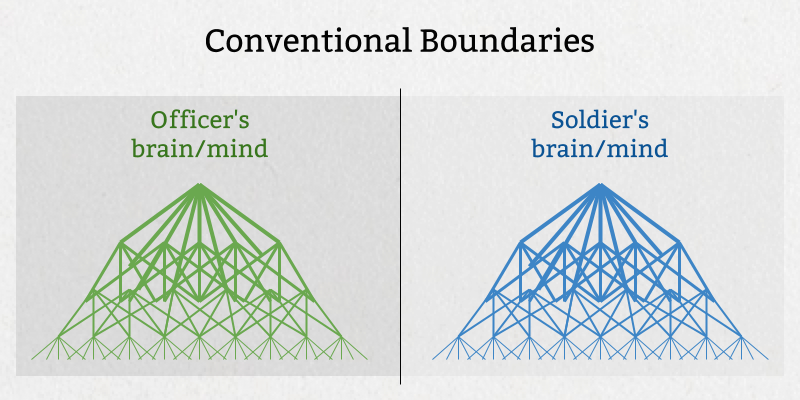 We have to simplify by delineating each person (each mind) along strict body-boundary lines. (It's the natural Schelling point.) But unlike society, nature has neither use nor respect for clean boundaries. If the extended phenotype of a beaver can include its dam, then the extended phenotype of a human being might well include networks inside other brains. The mind, as we've seen, can be broken down into parts (just like the body). We've already discussed memories. Let's very briefly examine some of the other parts, noting one or two examples of how the boundaries between 'you' and 'the rest of the world' continue to blur. The unconscious. Surely you identify with everything you're conscious of (right?). But how far 'down' into the unconscious do you extend? Do you identify with all your hidden preferences and prejudices (even your racial prejudices)? Are there little slivers of 'you' to be found in all your mostly-forgotten memories? In the way you process visual information? Including all the quirks of your visual cortex? If you bumped your head when you were little and have a patch of dead neurons in your visual cortex, but your other neurons have mostly compensated for the loss (and you've never noticed the difference) — is that a part of who you are? Clearly these fine details get less and less important to your identity. But the point is, there's no fixed depth at which the processes that compose 'you' cease being 'mental' and turn into 'merely physical,' i.e., completely irrelevant. Even what goes on in the cells of your pinky toe have some (admittedly tiny) effect on how your mind processes information. Even what goes on across the room or halfway across the planet. Drugs. Say you've been taken Xanax on a regular basis for 10 years. Clearly that drug has altered some fundamental parts of your mind, and therefore altered who 'you' are — and if you were to go off the drug, you'd feel no longer yourself. So the pills you're taking must be part of your identity. But then what about the other 'drugs' you're taking on a regular basis: TV, exercise, work, other people? Are they part of your mind too? Procedural memories. In addition to episodic memories (like the ones we discussed earlier), you also have a lot of procedural or how-to memories — things like how to speak English, how to ride a bike, or how to do long division. Surely those must count toward your identity. But if the long-division algorithm is part of who you are, why not also include "having access to a calculator"? In my case, I'd feel more truncated, as a person, if I was forever prevented from using a calculator, than if I merely forgot how to do long division. Personality. How you react to things, how you conceptualize the world, how you make decisions — all of these are central to your identity. But here's a weird idea: what if personality isn't a concept that makes sense to isolate, delineate, put within a little box? What if the very notion of personality requires other people — a social ecosystem in which the personality is an adaptation? What if your personality only makes sense in the context of the people you interact with and how they treat you? Maybe you value yourself for being heroic — but if you lived in a utopia, how would you know your own heroism? Maybe you fancy yourself high in humility — but if everyone started treating you like a god among men, how long would that humility last? Maybe the only reason you act and think the way you do is because it's a response to the people around you. If that's true — and I think we underappreciate how true it is — then a very important part of your mind is not meaningfully separable from your social environment. How other people behave, and what's in their minds, determines your identity almost as much as what's 'in' your own mind.